This is a joint giveaway with Living Peacefully with Children and Natural Parents Network. You may enter at one site only. Please find the section marked “Win it!” for the mandatory entry and optional bonus entries. Carole P. Roman is offering three of our readers their own copies of the Captain No Beard series (Captain No Beard, Pepper Parrot’s Problem with Patience, and Stuck In the Doldrums) a value of $30 x 3 (combined total ARV $90). Reviewer received a free sample for review purposes and consideration was given to NPN for hosting the review/giveaway. Links may be affiliate links. 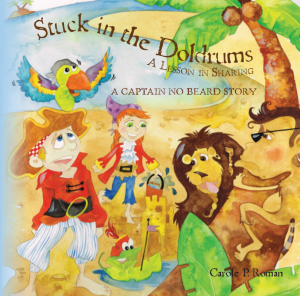 Stuck in the Doldrums, by Carole P. Roman, continues the tale of a young pirate’s life. 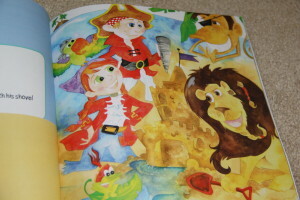 Alexander, the pirate captain extraordinaire, and his cousin and first mate, Hallie, are joined by a menagerie of a crew: Mongo, the “mast-climbing monkey,” Linus, the “loud-mouthed lion,” and Fribbit, the “floppy frog.” Together they travel on their ship called the Flying Dragon, whose name was chosen for its fear-inducing qualities. Without a wind to lift their sails, Captain No Beard and his crew find themselves marooned on a desert island, or as he says, “stuck in the doldrums.” The crew decides to make the best of the situation and sets about enjoying their day. Cloud watching, beach playing, and sand castle building top their list of activities. Seeing his crew enjoying themselves, Captain No Beard tries to steal some of the fun for himself with orders until he finds that no one wants to be around him. Off to the ship by himself, he declares he will do everything himself. However, when a giant squid attacks the boat, he quickly realizes that he can’t go it alone and calls for help from his trusty crew. The crew is met with indecision, due to the earlier treatment received from their captain, but compassion prevails, as they vow to help first and talk to him later. With the help of the fearless crew, the Flying Dragon is saved, and Captain No Beard apologizes for his earlier actions. The story has merit for parents and children alike, but I have to disagree with the title “Stuck in the Doldrums: A Lesson in Sharing.” The book isn’t about sharing at all. It is about perversion of power and how we use and abuse the power and trust given to us by others. It is a reminder that others, including children, deserve to have a voice and choice in their lives. As Captian No Beard learns, “Just because you’re in charge doesn’t mean you know everything. A good captain must always consider everyone’s feelings . . . .” With less of the playful pirate lingo found in the first of the series and with drawings which are less crisp, Stuck in the Doldrums still provides an easy segue into discussing an important issue between parents and children. You can purchase your own Stuck in the Doldrums, along with the other book sin the series at Barnes and Noble, Amazon, or Create Space. The books sell for approximately $10 each and shipping ranges by site. 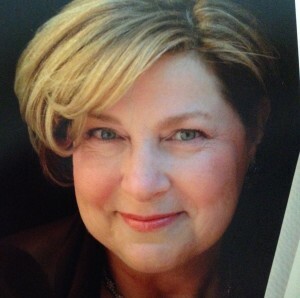 Carole has another children’s book in which yoga is incorporated into every day life: I Want to Do Yoga, Too Her newest book series, If You Were Me, focuses on helping children learn about other culture and understand the global connection we all have.To stay connected with updates, Like her page on Facebook. For your own chance to win a copy of Captain No Beard from Carole P. Roman, enter by leaving a comment and using our Rafflecopter system below. Three winners will receive copies of the Captain No Beard series of books. Contest is open to residents of the United States only. MANDATORY ENTRY: Simply leave your name and email address in the Rafflecopter entry form. Leave a valid email address so we can contact you if you win. Email addresses in Rafflecopter are not made publicly visible. When commenting for extra entries, please leave the same valid email address in your mandatory comment so we can verify entries. This is a joint giveaway with Living Peacefully with Children and Natural Parents Network. You may enter at one site only, and we’ll be recording IP addresses to ensure that there are no duplicate entries. That said, please do visit and enjoy both sites! No purchase necessary. Entrants must be age 18 or older and be residents of the countries listed at the giveaway post. The number of eligible entries received determines the odds of winning. Winner(s) agree to hold Natural Parents Network and the giveaway hosts harmless for any problem with receipt and/or use of prize. Winner must contact the product seller or manufacturer directly if there is any problem with the prize or prize delivery. Winners are responsible for any taxes or customs fees related to prize winnings. NPN and the giveaway hosts reserve the right to publicize the winner’s first name. Void where prohibited by law. Contest closes June 8 at 11:59 p.m. Eastern Time. 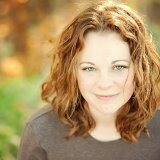 Mandy O’Brien is a WAHM to four fantastic unschooled children. You can read a bit about their lives at Living Peacefully with Children, where she writes about equality, learning, and life. My daughter loves pretending to be a pirate. That’s just one reason why I’d love this book. My three year old daughter Lyric would enjoy our new Captain No Beard books. Our little baby boy would enjoy the new Captain No Beard books. Our baby boy is only 6 months so he doesn’t have very many imaginary adventures but we read to him once in the morning and once at night. We love reading in our house, and we especially love books that give us lessons to think about! They’ve made up a bedtime story “series” called “The Adventure Kids”, which feature all three of the kiddos in every story. Each time is a new adventure: on a boat, on an airplane, in the jungle… so fun! My 3 & 4 year old will LOVE the book! I would share these with my nieces. They have such fantastic imaginations, and inspire me to look at the world in new ways and with wondering eyes. my little one is only 1.5 but she certainly seems to have quite the imagination. She is always making, stirring & offering me fake food 🙂 so cute!